See the latest from Fairway Green, below! Does Your Lawn Have Winter Injury? At the time of this writing, we had not seen many lawns with signs of potential winter injury on warm season turf. However, damage may have occurred on some warm season turf from late frost and cold temperatures. Centipede is the most cold intolerant of all warm season turf and tends to green up sooner than other warm season turf. Many Ornamental trees and shrubs sustained frost damage on new growth. Most will recover and be fine. Bermuda, Zoysia, Centipede and St. Augustine started transitioning out of dormancy the prior couple weeks due to warmer soil temperatures and could have setup these grasses for potential injury. We will know more in the coming weeks as we get closer to May/June. Warm season winter injury can be wide spread or just in micro-environments. Most warm season turf will start actively growing through May and June. 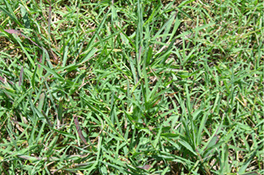 Crabgrass will usually start to germinate in late March or early April throughout the Transitional Zone. Germination will occur when soil temperatures are between 53 to 58 degrees and 3 to 4 inches deep. Crabgrass germination will be seen first in bare spots with little desirable turf and in full sun. 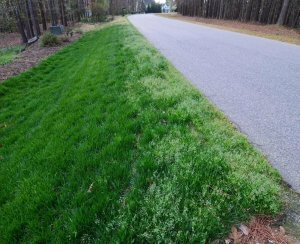 Split applications of pre-emergent Crabgrass control perform well. There is still time if you missed your first application of pre-emergent to control a fair amount of Crabgrass, but you must act quickly. What is the proper mowing height for my grass? Mowing season is underway (for cool season turf). Proper mowing height will help control weeds in the lawn. Research has proven that maintaining a mowing height of 31⁄2 – 4” on fescue drastically reduces the amount of crabgrass in the lawn. Mowing at this height will also help promote healthy turf and hold back broadleaf weeds. Many warm season turf lawns struggle to strive due to improper mowing height. 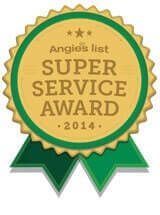 Mowing your type of warm season turf will drastically improve the overall quality and appearance of the lawn. Bermuda in a home lawn requires mowing every few days at 0.5” to 1.5”. Mowing at this height encourages denser turf and spreading. The lawn will look thin and grow upward if mowed above this height. In addition, it lowers the quality of the grass increasing the possibility of damage. Zoysia requires a mowing height between 1.5” and 2.5” based on your particular variety. A safe bet would be around 2”. Centipede needs to be cut low around 1” to 1.75” to perform well. St Augustine requires a mowing height of 1.75” and 2.25”. Do I Have Crabgrass or Poa annua? Fairway Green has been receiving many calls from customers and non-customers concerned that they have Crabgrass in their lawn. However, in most cases it is Poa annua they are see and not Crabgrass. Due to the slight increase in ground temperatures this spring, Poa annua is noticed a little earlier in Fescue lawns due to the light colored seed heads. Poa annua does a good job of blending into Fescue until it starts to seed. Poa annua (Annual Bluegrass) is an annual grass that is most noticeable this time of year because of the large amount of tan colored seed heads the plant is producing now. Poa annua actually germinates in the fall starting in late August through the winter; the same time you seed Fescue in this area. This is why pre-emergent applications for Crabgrass in January, February and early spring do not control Poa annua. Poa annua was mature when the pre-emergent applications were applied. Poa annua will generally end its life cycle in Late May and June. It is a prolific seeder and seed is generally viable the following year. It typically grows in areas that have poor compact soil and where your desired turf is thin or nonexistent. However, being it is a common grassy weed in our area; it can be found anywhere, even in the middle of the yard. Fairway Green will start the Mosquito Control Program in May. Applications will offer control for about 25 days. 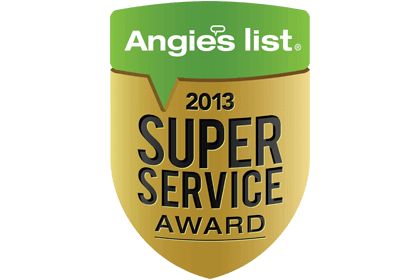 Safely enjoy the outdoors this summer with Fairway Green’s Mosquito Control Program. A one-time application is available and is great for special outdoor events. Now is a good time to inspect your ornamentals for signs of insect activity. Scale is an insect that is present year round. However, spring can be a good time to start controlling some Scale while they are in the nymphs (crawling) stage. Scale crawling stage is when they are most vulnerable to contact insecticides before they produce their hard outer coating. Scale is one of the most difficult insects to control on ornamental trees and shrubs. Are Tall Weeds Growing in my Bermuda Lawn? 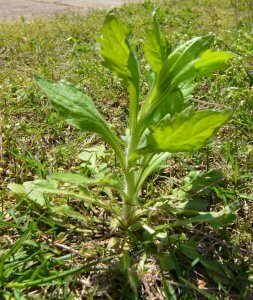 If you start seeing a tall weed growing in your Zoysia or Bermuda lawn this month, it could be American Burn Weed. This weed usually germinates around March/April and through the summer. It prefers man-made or disturbed sites. It is more noticeable in warm season turf at this time because the mowing season has not started yet for that turf type. American Burn Weed has a straight stem with varying sized and shaped leaves even on the same plant. However, most of the leaves will be lobed. The stem will have many translucent fine hairs on it. The plant can germinate in the thatch layer of warm season turf. This is why it is common to see in warm season turf after it has had a pre-emergent applied. Post-emergent broadleaf weed control can help control this plant prior to flowering. American Burn Weed doesn’t like to be cut and often can be controlled just by mowing it. Interesting fact: Wasps of all types are the dominate pollinator for American Burn Weed. irrigation or humidity. 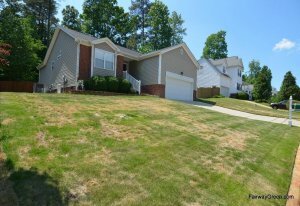 Brown Patch fungus can be devastating to the lawn. Signs of Brown Patch will be an off color similar to drought stress, lesions on the leaf blade, browning of the turf in circles or areas. 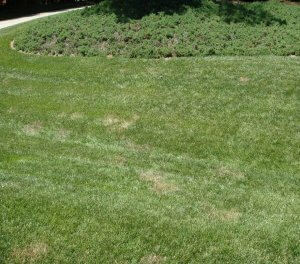 The easiest way to identify Brown Patch is to stand away from the lawn and look for a shadow appearance on the lawn. 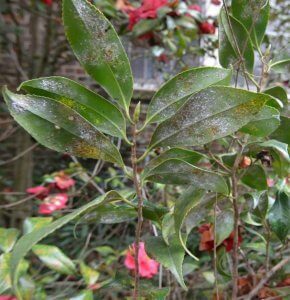 Once you identify the area of concern, look at the leaf blades of the plant for tan or brown lesions on the leaf blade. If you see these lesions, more than likely, you have Brown Patch. Drought stress can be mistaken for Brown Patch. Drought stress will make the leaves fold at the center giving the leaf blade a straw appearance. Applying fungicides preventively offers better control and less turf damage vs. curative fungicide. We typically see Brown Patch starting in Fescue in mid-May through August.